Here ye, here ye! 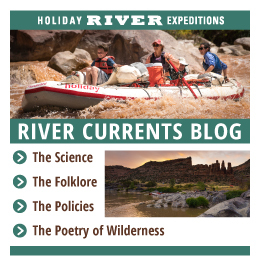 Holiday River Expeditions and Middle Fork River Expeditions have begun a new chapter in their partnership; now allowing Holiday to continue offering world-class trips on the Main as well as the Middle Fork of the Salmon River. We at holiday don’t choose our partners lightly; we feel anyone who we would book for must meet a high bar and have some key trappings of Holiday’s ethic and service baked into their own operation. That brings me to the story of James Ellsworth. James, a 5th generation Utahn, spent much of his childhood water-logged in 10 man military surplus rubber-rafts that his grandfather would use to take float trips with his Salt Lake City based company’s employees. These rouge “business retreats” were a great excuse for James to sneak out into nature and a spark for wild rivers was ignited. 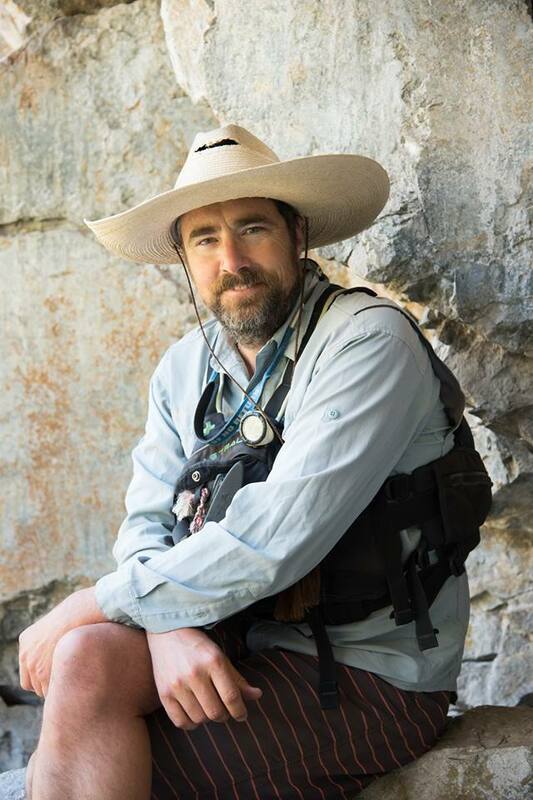 He spent a number of years guiding on the Salt River and working towards a Masters in Geomorphology, studying sand-bars in the Grand Canyon. Eventually, time in the classroom was eclipsed by the sheer awe of ‘doing the thing’ and living his life on rivers. So in 1993 he found his way to Holiday River Expeditions where he angled for one of a few coveted guide positions in that years batch of candidates. He knew his years of experience guiding on the Salt wouldn’t do him much good and ironically be seen as a count against him, as Holiday guides truly excelled when they learned the “Holiday Way” from the start. Yet Ellsworth’s background in geology and as he says “asking the question ‘what’s happening? !’” earned him a spot on the team due to Holiday River founder Dee Holladay’s persistent emphasis on interpretation. During Ellsworth’s tenure at Holiday Tim Gaylord, Holiday’s Operations Manager recalled “he certainly showed his ability to grasp our concepts, and quickly moved through the ranks to become a trip leader” James even started to influence Dee and the “Holiday-Way” when he piloted our first draft at a compost system. On river James would collect food scraps and then make a short stop along the shuttle drive back to headquarters to visit the local Green River horses along Hastings Road and give them a humble feast. “Fred”- The monkey getting into trouble as usual, during a boat-yard pool-party. His love of animals was notoriously remembered by Holiday staff; as he had a Bonnet Macaque monkey named Fred who lived at the headquarters one summer. Fred would get into all kinds of trouble, including deflating the air on the boat-trailer spare-tires by pushing the needle valve in and blowing pressurized air into his mouth. He was also quite an escape artist, once found relentlessly honking the horn of a U-haul truck down at the John Wesley Powell River History Museum surrounded by a crowd of confused tourists. In any case, James’ love of the wild led him to continuing his life’s work in the wilderness beyond Holidays shores and also left Holiday with a newly instituted “Pet Policy”. 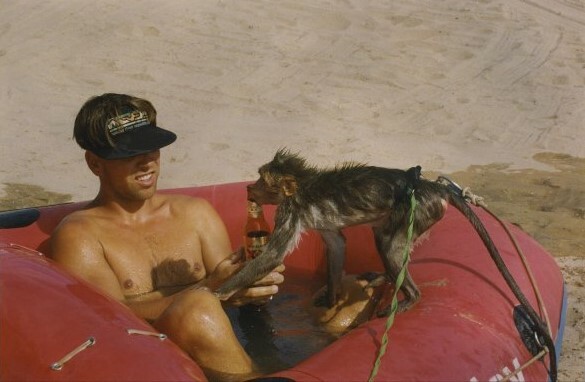 In 1997, James headed to Mountain Travel Sobek where he spent the better part of a decade on the administrative end of an outfitting company; managing hundreds of employees all over the world and taking point behind the scenes for multiple first descents. While getting a feel for the back-end operations with Sobek, James found himself up in Stanley Idaho acquiring a permit on the Middle Fork of the Salmon River. Once he had a taste for crystal-clear Idaho rivers, he couldn’t leave. Meeting with veteran river-outfitter and founder of Middle Fork River Expeditions, Pat Ridle, he expressed interest in a dream of someday running his own outfit out of the quiet town of Stanley; and not a year later, in 2007 Pat was calling James back to pass the torch of Middle Fork River Expeditions to the next generation of boaters; thus the present day outfit was born. After acquiring a Main Salmon permit MFRE was a dual river trip company; able to offer exhilarating more adult focused Middle Fork trips in the earlier season as well as integrated family friendly trips on the Main Salmon, having its best months in the latter half of the summer. James has spent the past decade shaping MFRE with the skills James had acquired at both Holiday and Sobek, including a full-scale renovation of the original boat-house in Stanley. Now in 2017, with James acquiring the final touch to his new boat-house, Holiday Idaho’s original ice-making machine, Middle Fork River Expeditions sits perfectly positioned as a northern partner to Holiday’s Colorado Plateau based river trips. James has maintained many of the same ethical standards he had while guiding for Holiday, one of the most important of which is a commitment to motorless trips. With a fleet of entirely oar-powered craft, MFRE trips are following in the oar-strokes of Dee Holladay, using this quiet and intimate way of transportation to better enjoy the hush of nature and the truly incredible alpine wilderness both sections of the Salmon River cut through. 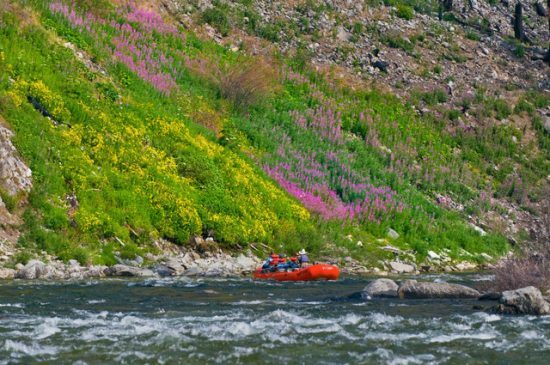 Both of these river trips garner their own respect for similar reasons; both stretches have clear water, great fishing, thrilling whitewater, ponderosa forested shorelines and a smattering of epic hot-springs. 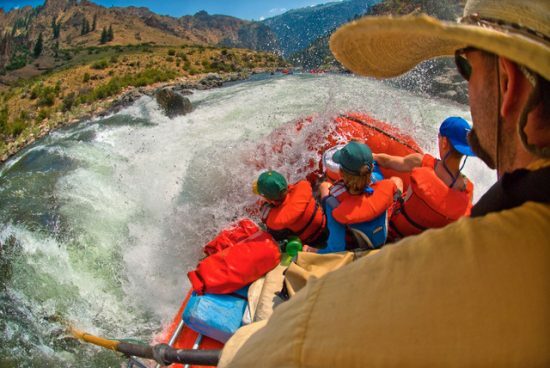 However there are hallmark differences between the Middle and Main: While the Middle Fork is a narrow gorge and has literally hundreds of rapids, the Main opens up to more spacious big white sand beaches. The Middle Fork noted for its pristine wilderness aesthetic also contrasts with the frontier homesteads along the Main; places like the outpost of the infamous Buckskin Bill or more modern land stewards like Doug and Phyllis Tim’s homestead. Each waypoint with its own charm and character to add to the overall wilderness experience. 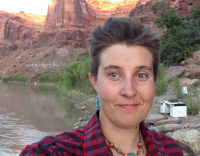 Us river-guides like to speak in terms of systems… ecosystems to be more specific. 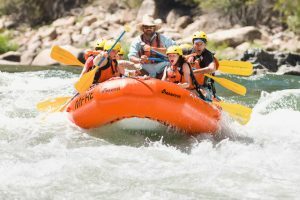 In this way, James Ellsworth and Middle Fork River Expeditions has become a niche species for us: highly skilled and specialized for alpine Idaho river adventures, while we at Holiday River compliment that in the canyon-country wild rivers we run in Utah and Colorado’s boundless backcountry. We look forward to seeing where this new network of old connections take us from here.